I love mushrooms just about any way you can prepare them but one of my favorite ways to use mushrooms has to be to stuff them. This stuffed mushroom is a little lighter than many of the other versions you will come across as the primary ingredient in the stuffing is creamy ricotta cheese. Now you can add or subtract any number of ingredients in this filling to change the flavor, but this version is the one I make most often. Other ingredients you could include would be olives, capers, or anchovies. You could also replace some of the ricotta cheese with goat cheese. Using low fat ricotta cheese help to cut the calories and fat in this recipe but do not use the fat-free version as the mushrooms will not be as creamy smooth. The low fat ricotta filling in this recipe contains much less fat than traditional recipes. 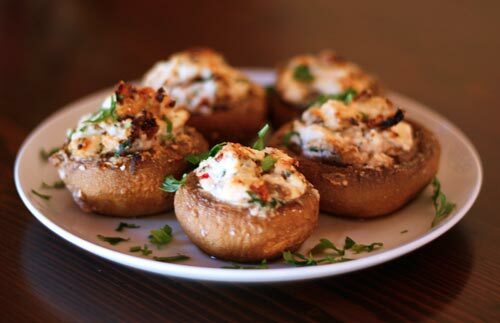 Ricotta cheese stuffed mushrooms are a light alternative to the usual stuffed mushrooms. In a heavy frying pan heat the olive oil and then add the mushrooms and onion. Cook until softened, then add the garlic and chile pepper and cook another minute or two. Allow the mixture to cool and then add the parsley, tomatoes, and ricotta cheese. Lightly oil a baking sheet and place mushroom caps cut side up. Brush the caps lightly with olive oil and then spoon the filling in. 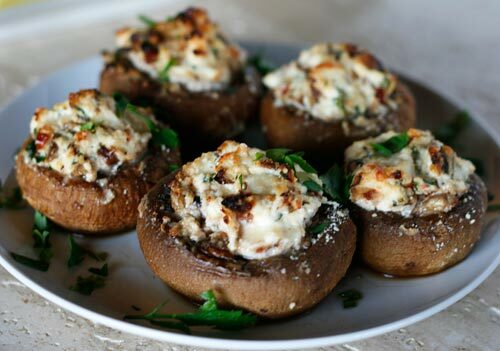 Sprinkle with the grated cheese and then bake for about 20 to 25 minutes or until the mushrooms are tender when pierced with a knife and the tops are lightly browned.